If an irritation is present, one of the first things to do is to determine whether the irritation is from a plant rather than from an animal or fire. If someone else has the irritation, ask that person questions in order to ascertain the nature of the problem more precisely. Some common sources of plant poisoning are poison ivy, poison oak, and poison sumac. Hence, it is wise to learn more about their effects, which will prepare you in the event you or someone else makes contact with these plants. Wash the affected area of skin thoroughly with soap and cool water to remove any poisonous residue. Be sure the water used to clean the area does not spread poison by running over other parts of your body. Using a washcloth could also spread the poison. Rinse the area with rubbing alcohol. Apply calamine lotion to the area to relieve itching and burning. If the victim develops a fever for several days or experiences an excessive amount of inflammation, irritation, oozing, or itching, he/she should be treated by a doctor. If a child has swallowed poison, do not try to make the child vomit as this may make the child more ill. If poison is on the child's skin or clothes, remove the clothing and pour large amounts of water over the skin. Wash the skin thoroughly several times with soap. If a child gets poison in his or her eyes, splash clean water in the eyes for at least 10 minutes. Take the child immediately to a health center or hospital. If possible, bring a sample of the poison or medicine or its container with you. Keep the child as still and quiet as possible. If you are alone, believe you are suffering from poisoning, and cannot use the phone (for example, you are too weak, are not near a phone, cannot get to one, or cannot punch in the numbers), you can still get immediate help if you are a member of Life Alert. 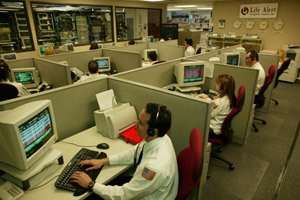 Simply press your pendant to get in touch with live dispatchers within seconds, 24/7. They can send help to you, which will arrive in a matter of minutes. Life Alert members who are not at home can also use a special one-button 911 cellphone (an optional Life Alert feature). If you don’t currently have Life Alert, see below for links to information on this valuable service.